The Dolphin Inn is widely known as one of the most popular bars in Costa Teguise. Less known is how good a restaurant the Dolphin Inn is. A seafront location, traditional English decor with warm and friendly staff make a great place to both have a nice drink and lovely meal. The dedicated chef produces great food throughout the day. Unrivalled for quality and price the Dolphin English breakfasts bring customers back day after day, year after year. 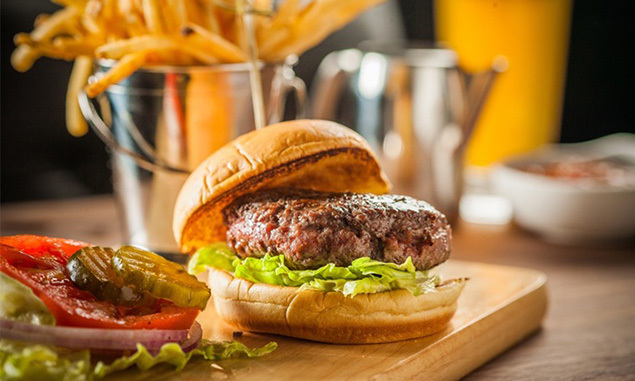 The use of authentic quality products marks a significant difference.The restaurant evening meals come from a well thought out menu with a different featured signature plate every day.Monday is gourmet burger night, these are quality home made burgers to make your mouth water. Tuesdays features ‘big tender ribs’. On a Wednesday treat yourself to a large juicey steak cooked to perfection however you like it. Thursday is Mexican night. Friday follows English tradition with Fish and chips. Saturday, again an English after pub tradition, is curry night. Keeping the traditions alive on Sunday you can finish the week in style with a home cooked Sunday roast dinner with all the trimmings. As well as daily signature meals there are other menu selections plus bar snacks, sandwiches and drinks. There are plenty of comfortable places to sit and enjoy the food. The sun terrace allows clients to take some sun and enjoy the views whilst under a shady parasol or in the glorious Lanzarote sunshine getting a tan. Inside are varying sized booths and tables to accomodate any sized group and seating preference. After choosing your meal from the delightful menu staff will serve you the food and drinks at your table. All of this quality and finely honed selections are not available by accident. The Dolphin Inn is one of the longest established and most popular bars and restaurants in Lanzarote and Costa Teguise. This being hard won with highly trained warm staff and years of experience. Customers come back year after year making the Dolphin there favourite place to eat and drink whilst visiting Costa Teguise in Lanzarote. Dorada is the local beer. We also serve Peroni, Worthingtons, Caffreys, Guinness, Strongbow, Blossom Hill, Strongbow, Kopparberg plus lots more. Too much to write here, lol.